2010 was a big year for the Mac. The beginning of the year was all about the iPad—followed by the iPhone. 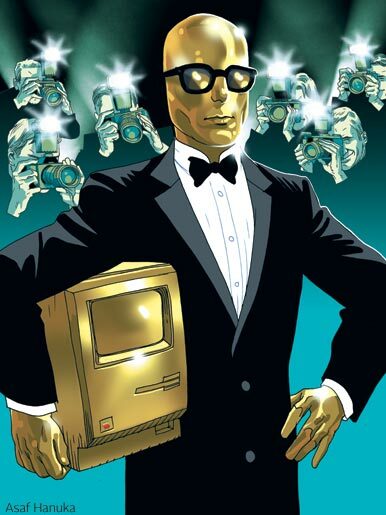 But the buzz and success of those two products trickled down to the Mac. Later in the year, we saw upgrades to the Mac lineup, as well as solid signs from Apple that the Mac hasn’t been forgotten. With record sales of Macs posted by Apple, it’s a very good time to make products for the Mac. With hundreds and hundreds of products that are released every year, we look for the ones that truly stand out, the products that offer the best quality, innovation, and value. After a year (we restricted ourselves to products released between November 1, 2009 and November 1, 2010), we put together a list of the top products, and we spend several weeks discussing the merits of each and every product. I recently heard someone say, “There are two kinds of Mac users: those who won’t use a Mac without 1Password, and those who’ve never tried 1Password." 1Password 3 ( ) by Agile Web Solutions is a systemwide password manager that lets you save to its encrypted database login information for any Web site (even those that try to prevent it) and retrieve that information at any time, even from within a different browser. 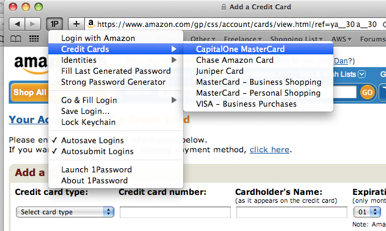 To make your login passwords more secure, 1Password includes a powerful password generator. But 1Password also saves secure notes, software licenses and registrations, personal identities (addresses, phone numbers, and the like), and credit-card information. It can even paste the data from any identity or credit card, making it easier to complete Web forms or to shop at online stores. Doing so is also safer, because you won’t be tempted to let those stores save your personal info for the sake of convenience. This small, fun, and powerful camera from Sony is a standout in a burgeoning class of interchangeable-lens cameras. Straddling the line between a point-and-shoot a DSLR, the Alpha NEX-5 ( ) has done an impressive job of packing advanced features into a slim and light body. It has a 14.2-megapixel CMOS sensor, HD video recording, a 25-point auto focus system, and a great 7 fps burst mode. Even though the body of the camera is small, it has a solid grip and an adjustable 3-inch LCD screen. 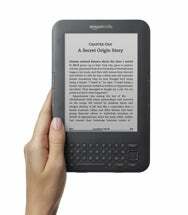 Although many of us use our iPads to read books and magazines, if you’re looking for a pure e-reader, it’s hard to beat the third generation Amazon Kindle ( ). The Kindle now has a 6-inch E-Ink Pearl display, one of whose benefits is 50 percent better contrast. Plus you can read it clearly even in bright light, something the iPad can’t do (and it’s about one-third the weight of the iPad to boot). It has almost double the battery life of the previous generation of Kindle, is faster when turning pages than before, and its redesigned case, buttons, and keys make it even more enjoyable to use than in the past. Apple added a handful of great features to Aperture 3 ( ) that made it an appealing option for photographers who had outgrown iPhoto as a photo manager. Though typically aimed at more professional shooters, Aperture 3 added consumer-level features such as book design, Faces, and Places. These features, combined with the program’s intuitive layout and easy to understand tools, make it a great crossover application for all levels of photographer. Despite the flock of cases that appeared in the wake of the iPad’s release back in April, the handmade Dodocase ( ) has managed to alight on our list of best products for the year. Quite a feat for a flightless bird. Most could assume (and perhaps rightfully so) that Dodocase’s tagline, “Protects from Extinction” is a nod to the bird from which the company takes its name. And yet, it also calls to light the endangered craft by which these cases are made. Created and constructed by a team of bookbinders in San Francisco, the Dodocase combines old-world charm and modern technology without ever feeling gimmicky or cheap. The case, which mimics the outer appearance of a hardcover moleskine notebook, holds the iPad in place with a simple bamboo frame and a set of small foam cushions, adding a mere 8 ounces to the total weight. But don’t mistake the relative simplicity of the case’s construction for delicacy: while we wouldn’t suggest letting it fly off a roof at 70 miles per hour, the fact remains that the Dodocase is expertly crafted. In the last couple of years, Evernote has gone from a cool, cloud-based note taking utility to a must-have productivity powerhouse. Whether at your Mac or Windows computer, on your iPhone or Android device, or on your iPad or other tablet, you can save a Webpage, audio clip, text, and more to Evernote and it’s available everywhere that you are. You can use scanners from Canon, Doxie, and Fujitsu to scan items directly to Evernote. You can take pictures with your iSight camera from within the Evernote application (and you can do the same with the Evernote iPhone app), save audio notes, and capture your entire desktop screen (or portion thereof) into a sortable, searchable entry in Evernote. Oh, and did I mention that its free! There is a paid, premium ad-free account available for $5 a month or $45 a year with larger file size and but the free version will suffice for most. When Microsoft released Excel 2008, it was a step back in the development of the popular spreadsheet program—it didn’t have new must-have features, and it was missing support for macros. Fortunately, Excel for Mac 2011 ( ) has hundreds of improvements and new features, making it a must-have upgrade for Excel users. With the new version of Excel, the interface was completely redesigned to promote efficiency, and the new Ribbon is the key interface module that displays easy access to frequently used functions. Spreadsheet users will love features like sparklines, which displays charts within a single cell, and the new PivotTable Builder that eases building and modification of pivot tables. Excel’s sharing and protection features were enhanced to include the ability to protect a cell’s contents while allowing changes to formatting, and full information rights management that allows users to specify users and groups of users with rights to a workbook. Macros also made a triumphant return in Excel 2011. Excel 2011 has some performance issues related to scrolling—it’s actually slower than previous version. But more importantly, the new Excel is faster than ever at number crunching. Apple’s iMovie has always made it easy to make simple edits to your videos. With iMovie ’11 ( ), Apple included tools that let you make more-complicated edits, but in that easy, accessible way that iMovie is know for. A major new feature is the Single-Row View that changes the way video clips are displayed; instead of running clips over multiple rows, Single Row View looks more like the traditional timeline view that professional video editors and iMovie HD users are familiar with. With the new One-Step Effects feature, adding an effect like fading a clip to black and white can be done in a few seconds. The new Rolling Shutter fix option can correct the “jelly” effect of moving objects recorded using CMOS-based camcorders. And Apple’s fun new Movie Trailers feature helps you create quick videos in the style of the movie previews you see at the theater. Most importantly, Apple improved the audio editing features in iMovie ‘11. You can have audio waveforms appear underneath your clips, a much-needed aid when editing. Adjusting audio levels is simple: select a range of audio, and then drag the volume bar up or down to change the level. Apple also includes a new set of audio effects. Imagine if, when coming across an interesting—or too-long-to-read-now—Web article, you could just click a button to save that article to a personal repository of Stuff To Read. And imagine if, when you sit down to read your archive of articles, each is automatically reformatted for easier reading. And wouldn’t it be really great if you could read those articles on any computer, iPhone, or iPad in an interface designed specifically for that particular device? As it turns out, the Instapaper Web service ( ) by Marco Arment does all that and more. Just click a bookmarklet in your browser and the current Web article is archived to your Instapaper account. 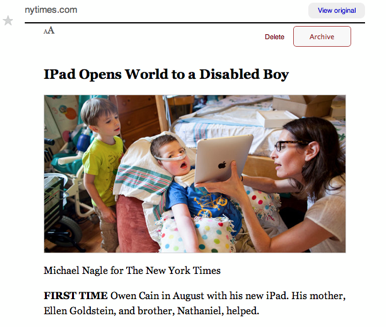 You can read a device-optimized copy of any archived article, stripped of ads and other distractions, using any Web browser or the outstanding Instapaper iPhone and iPad apps. If you’re familiar with other iOS devices, using an iPad ( ) feels right at home. That’s by design, and also why people were more than willing to plunk down their credit cards to order an iPad without ever having touched one. But anyone who calls the iPad “a big iPod touch” is missing the point. Because of its size and the fact that it’s based on an OS designed solely for touchscreen devices, the iPad could be called the first truly usable tablet device. It’s a great way to read books, magazines, comic books, and RSS feeds; solve crossword puzzles; watch TV shows and movies from the iTunes Store or using a variety of other apps; surf the Web with a full browser (sans Flash, yes); take notes and even write longer-form items (with or without an add-on keyboard); and a hundred other things. Businesses are using them to display wine lists, show off sketches to clients, and present balance sheets to board members.